A few weeks ago we got a ton of rain. Yes, I know, it rains a lot in Oregon, but this was insane. Creeks flooded, ponds formed (yay ponds!) and trees fell. We needed it, but not all at once! Anyways, as it generally goes in Southern Oregon, we have had amazingly beautiful and sunny days since. A few days into the sunny weather, I said to Joel, “I bet we can find some mushrooms if we go out looking…” Famous last words. I wonder why we didn’t see these on our way in? 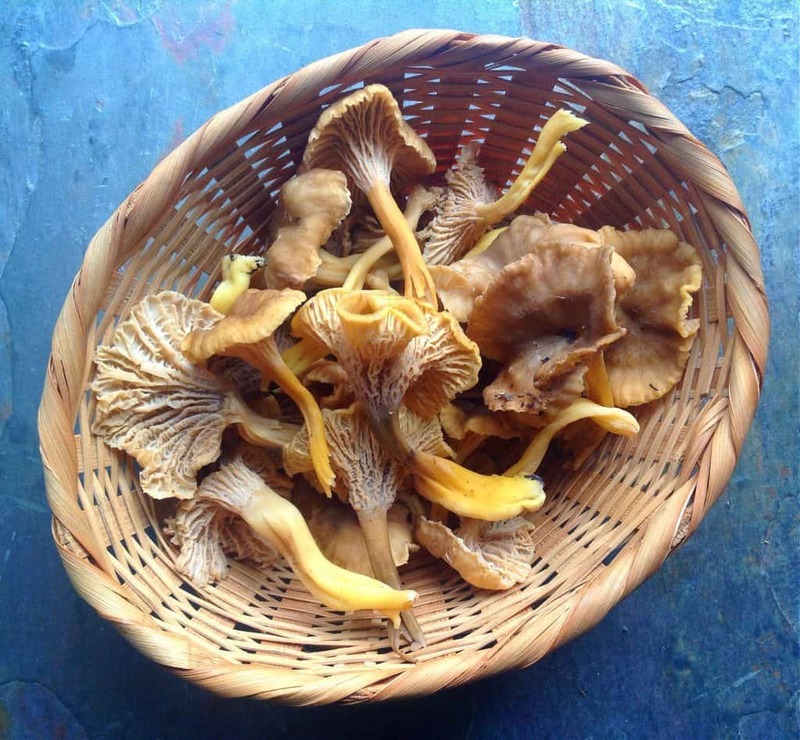 Goes to show you that even when you’re looking you still may not see… We thought they might be chanterelles so we picked a few. 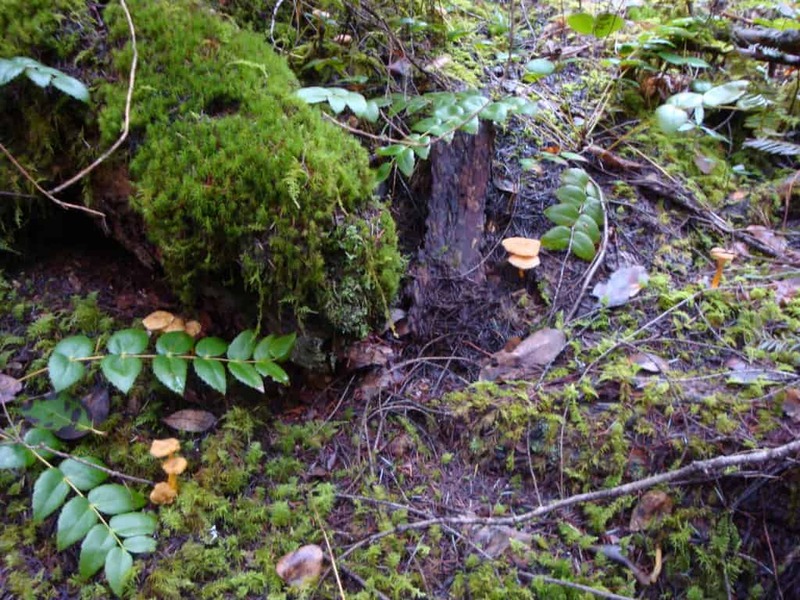 There were literally tons of these mushrooms… the more we picked the more we saw! 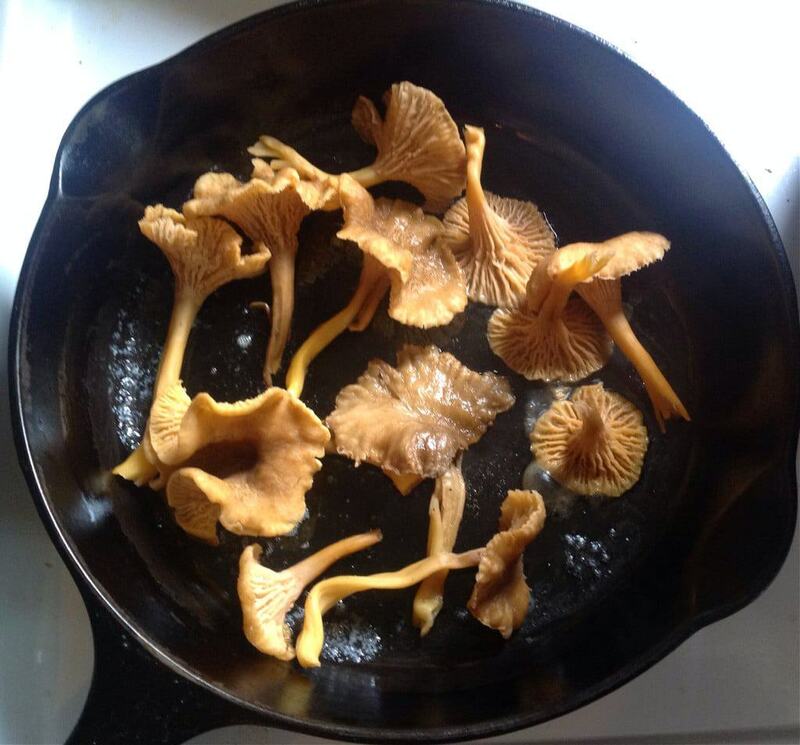 Since we weren’t sure if they were chanterelles, we only picked a few. They had the false gills of Chanterelles, but they also had a hollow stem. 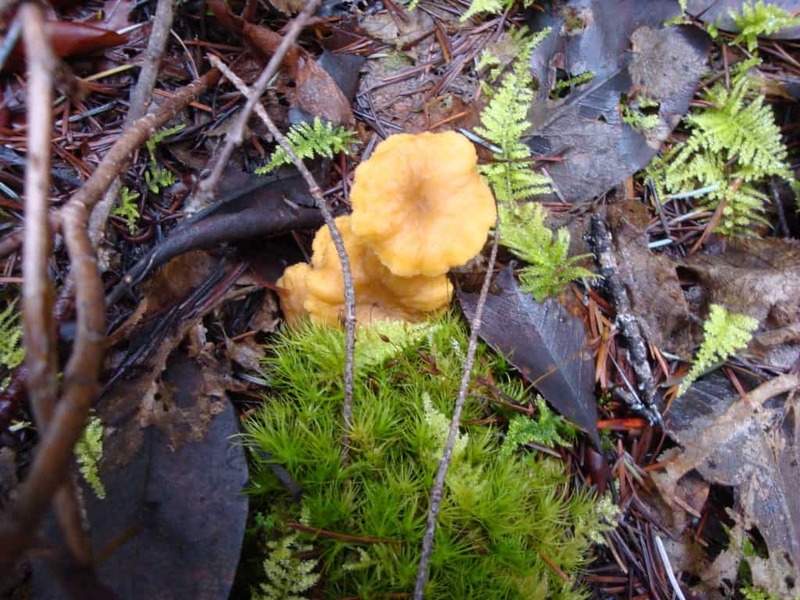 No chanterelle that I was aware of has a hollow stem. We brought them home anyways, of course. Needed to do further research. I took a bunch of pictures and studied my books. You don’t want to mess around with eating questionable mushrooms! 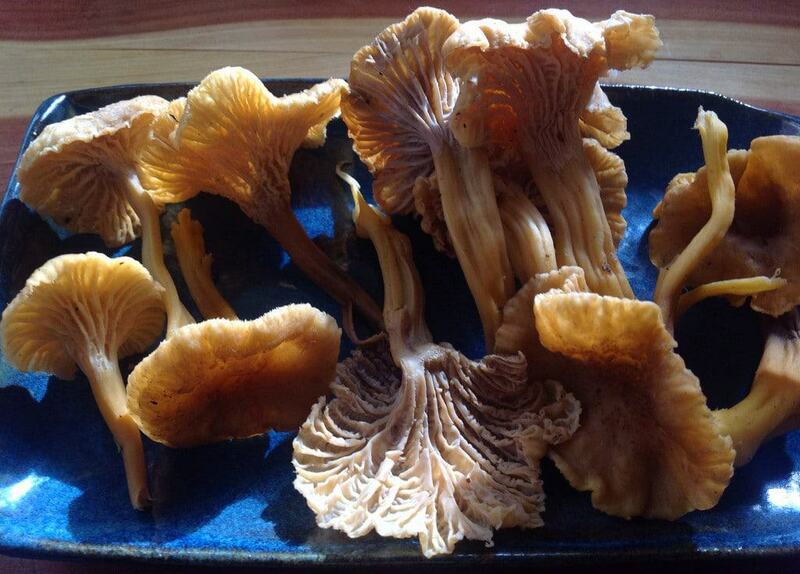 The gills were exactly like chanterelles, “false gills” they’re called, a major defining characteristic. Not sharp like the gills of most mushrooms, more like veins. But what about the hollow stems? I still wouldn’t let Joel cook them up. They sure are beautiful. 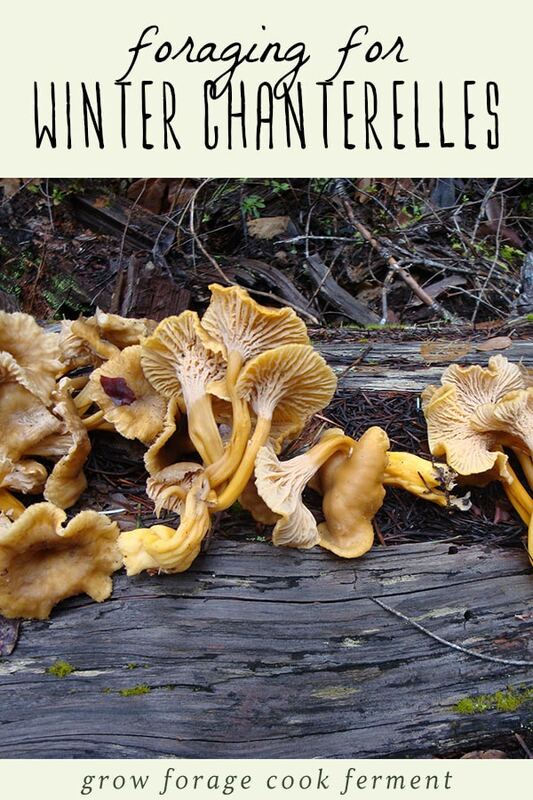 After a few hours on the internets and with help from other mushroom people, I discovered Winter Chanterelles. They have the false gills, a hollow stem and a funnel shape. This is what we had!!! Also called Yellowfoot, a name I prefer. They are not only edible, but extremely tasty. So, into the pan they went! They had a lot of liquid in them as they were a bit waterlogged from all the rain. A little bit of butter and a pinch of thyme is all they needed, and man these were delicious! So earthy and flavorful, exactly how a mushroom should be. Gorgeous! I sure hope to find some more of these in the near future. Luckily they’re plentiful in my neck of the woods! Finding and eating your own mushrooms is one of the most rewarding things that one can do, but please be very careful and consult a guidebook. One I highly recommend is All That the Rain Promises and More by David Arora, as it’s extremely thorough, easy to read, has great pictures and is small enough to put into a backpack. Better yet, take a friend who knows about mushrooms! 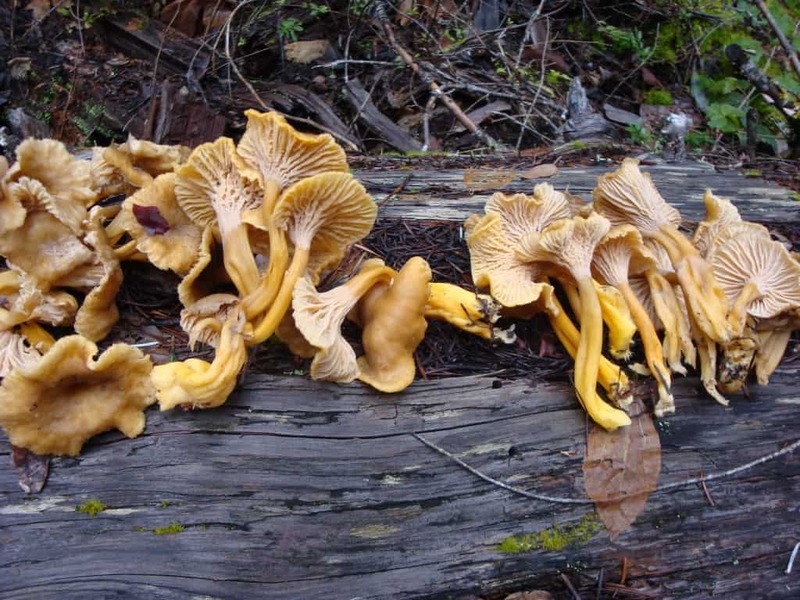 And definitely don’t pass up Yellowfoot Chanterelles. I just found some of these and that’s how I found your post. 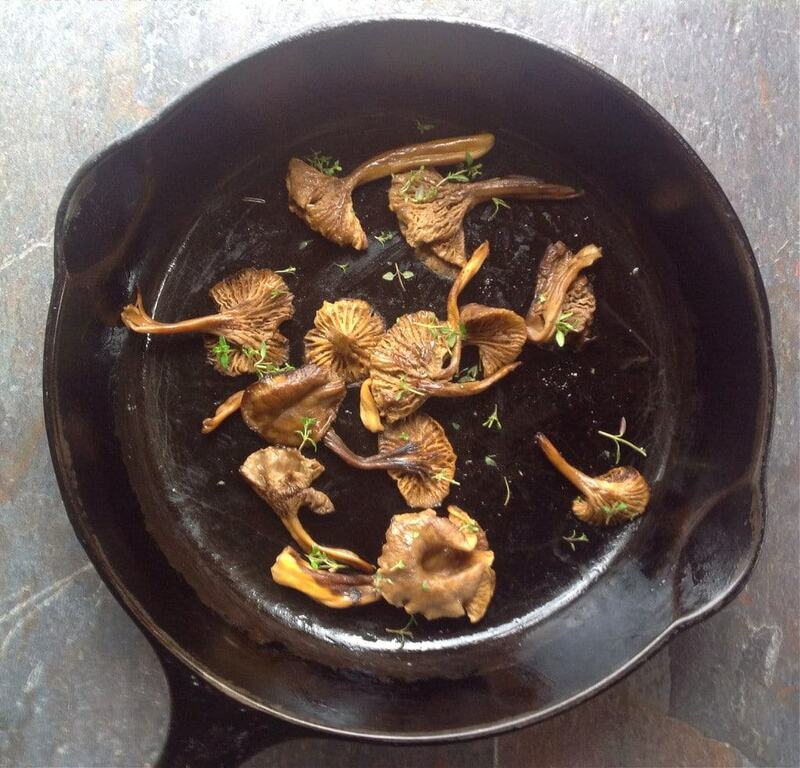 I just threw them away because I didn’t see any chanterelles with hollow stems. I’m sure this is what I found. However I’m going to look for some help from people that can inspect my mushrooms before eating. Photos, books, web pages and videos are helpful. I would feel a lot better if someone with experience who is holding the mushroom in their hand gives it their blessing. For several years I’ve been learning about herbs, making herbal tinctures and collecting herbs for my concoctions. I have just recently starting foraging for eating too. 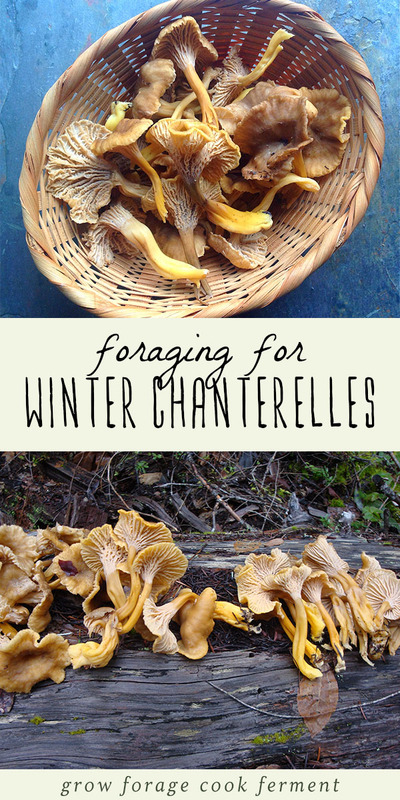 We took many trips into the woods this past fall and didn’t find any Chantrelles. I was bummed. I had no idea a few days of warm sunny days would bring them out this time of year. I’m so excited, thank you for letting us know! When we get over the flu the kids, the dogs and I are going mushroom hunting! If we get the families together, you will have to tell my daughter, Elie, about your mushroom foraging adventures. She has a “knack” for finding them, no matter where we are! I kind of joke that we should take her out and find truffles, because that’s exactly the kind of thing she would love to do! This sounded like a great day and very cool “outdoor” experiment for kids! You did so good! Those chanterelles are absolutely VIVID! Yum! 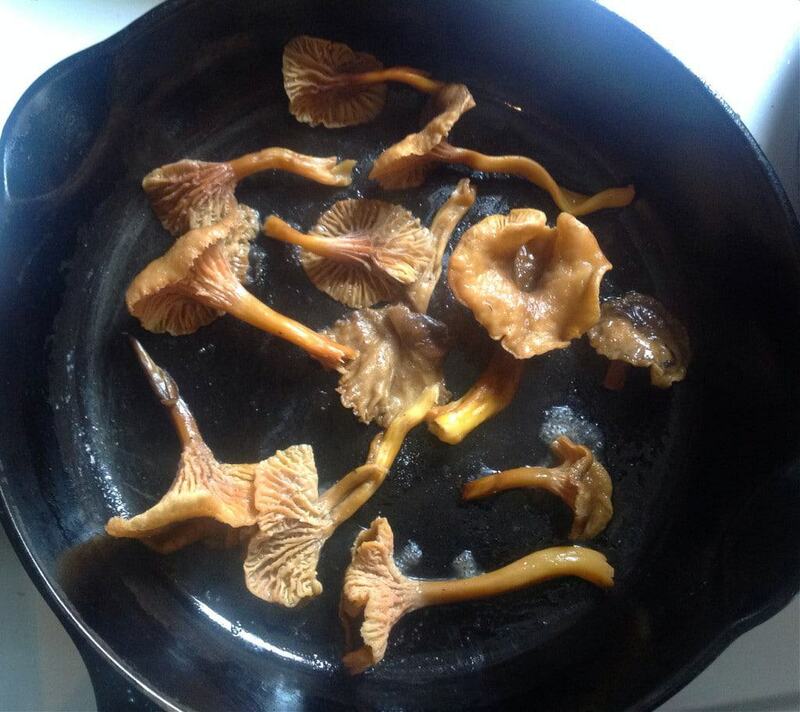 I would love to learn my mushrooms one day so I too can forage for their rich goodness. Thank you for sharing. I found your site recently and am really enjoying it, however, I can’t seem to find how to navigate all the posts together rather than having to click on separate subjects such as “ferment” or “grow”. I am interested in all these subjects, so is there a way to seamlessly navigate them all together? Thanks. Blessings. There are only a few edible mushrooms that I feel I know well enough to pick and eat, and luckily they’re pretty abundant where I live! Glad you’re liking the blog! I’m very new at this so I will try to make my site a little easier to navigate, thanks for the feedback.